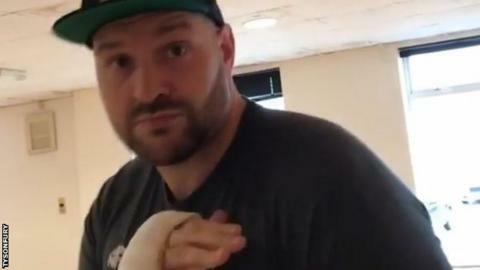 British boxer Tyson Fury has directed an expletive-laden rap at promoter Eddie Hearn after being cleared to resume his career. Fury also targeted the British Boxing Board of Control (BBBofC), which revoked his boxing licence in October 2016 because of medical issues. The 29-year-old has already challenged IBF and WBA heavyweight world champion Anthony Joshua to a fight in 2018. But Joshua's promoter Hearn was the focus of Fury's post on Wednesday. Rapping to Eminem's 'Without Me', the former heavyweight world champion said the BBBofC "tried to shut me down on sports TV". He added the sport "feels so empty without me", before directing an abusive message at Hearn. He will now have the suspension of his boxing licence reviewed by the BBBofC in January.